新近在missingbackpacker@gmail.com的邮箱中,收到以下邮件. 大意是,:" 四月下旬看到寻人广告的时候,隐约记得在四月中旬的时候,在Gorak的Himalayan Lodge(旅馆)的登记本中,见到有一游客资料,用中文写着来自深圳. (该店老板乐于助人并关心游客安危,会敦促所有单身游客登记个人资料.) 可是,当时未有留意该名来自深圳的游客姓名,以及登记日期." I saw the poster about missing trekker Peng Fuhao when coming down from Namche on Saturday, April 26. I didn't notice the name of the trekker, unfortunately, but believe the date was earlier this year. I'm also not sure of the name of the lodge at Gorek Shek. It's the first lodge, on the left, as you approach Gorek Shep from Labouche. My guidebook indicates this is the "Himalayan Lodge". The manager at this lodge is very helpful and safety conscious, urging all solo trekkers to sign the registration book. There is a telephone at the lodge, though I don't have the number. If I can be of any further assistance please let me know. The Consular Section of the Embassy of the People’s Republic of China in Nepal presents its compliments to the Tourist Police Office, Ministry of Tourism and Civil Aviation, the Government of Nepal and has the honor to seek the latter’s assistance to look for a Chinese citizen Mr. Peng Fuhao. 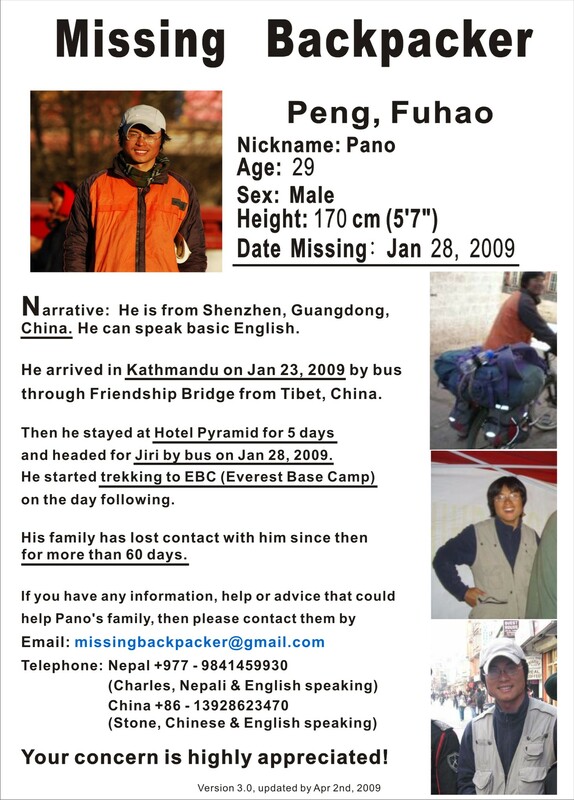 Mr.Peng arrived in Kathmandu on January 23, 2009 and started trekking to the Everest Base Camp on January 29, 2009. Since then, his family has lost contact with him. 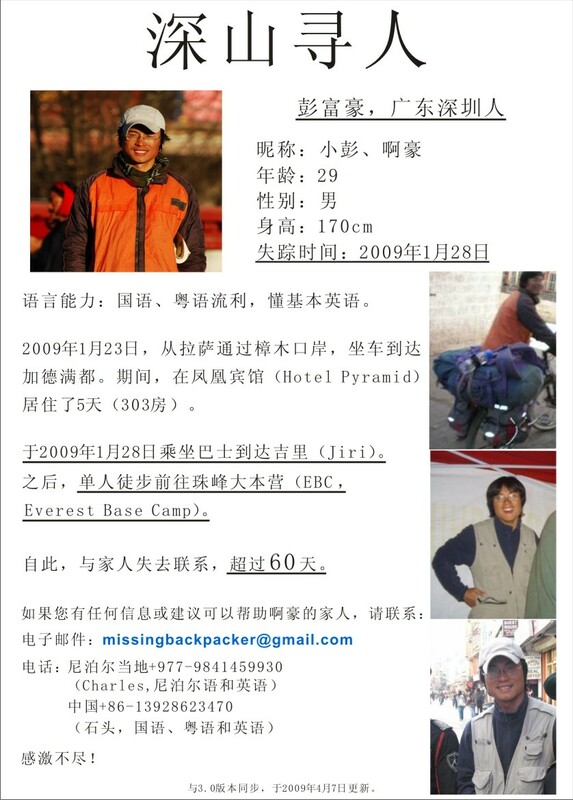 Mr.Peng’s photographs and other related information are attached herewith for reference. If any clue or new information is found, please inform the Consular Section as soon as possible. The Consular Section of the Embassy of the People’s Republic of China in Nepal avails itself of this opportunity to renew to the Tourist Police Office, Ministry of Tourism and Civil Aviation, the Government of Nepal the assurances of its highest consideration. 1. Always travel with the Legel travel agency. 2. Insurance is most important. 3. Take trekking guide and the porter. 4. Make a travel Insurance before travelling from china. 5. If you are travelling alone then Please take a TIMS and the PERMIT, along with you. That keeps your reacord. Please also release this message as well to all the chinese traveller those who are coming to Nepal. These things are really important. 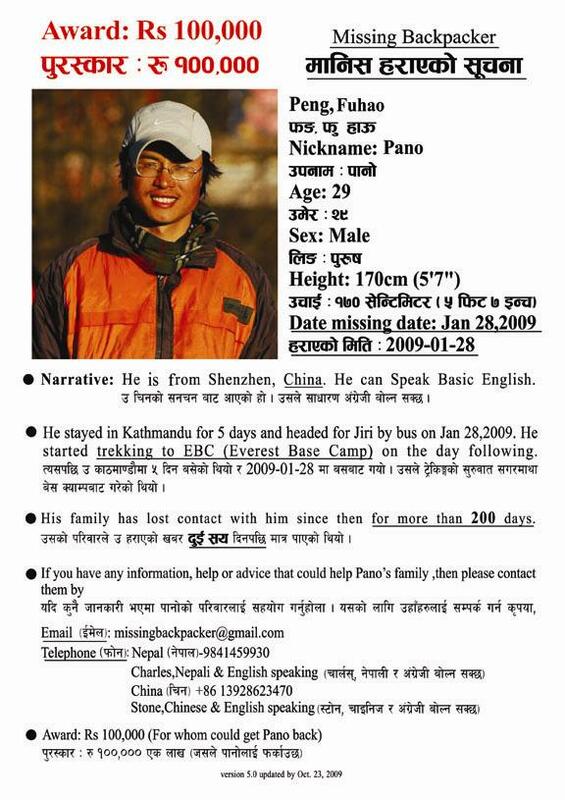 We received your leaflet regarding Pano who has been missing since last January. We will request concerned Nepalese authorities and inform you if any progress is made. Meanwhile, please also let us know anything you know further on this. guys ....all of us are waiting for you back home ! I wouldn’t say good bye to you, the world is small, and I do expect the day we meet again. I Believe he's gonna show up some day. God bless him!